The BJP's Karnataka chief B S Yeddyurappa on Friday rubbished as "atrocious and malicious" the allegation that he had paid Rs 1,800 crore as bribe to theparty top brass, after the Congress demanded a Lokpal probeinto the issue. The allegation has been already inquired into by the Income Tax department and it has been found that documents are"fake", the former Karnataka Chief Minister claimed, termingit as a "closed chapter". He accused the Congress of raising the issue as it was "frustrated" over its "imminent defeat" in Lok Sabha polls. The Lingayat strongman also said he was talking to legal experts on filing a defamation case. "To be frank all the issues being raised by Congress including one raised by them today about alleged payment of crores of rupees has been already inquired and it was found that documents are fake," Yeddyurappa said in a statement. He said the Income Tax department officials found that the documents, signatures and handwritten notes were forged. "Congress leaders who are apt in carrying out all these atrocious and malicious campaigns have planted this story in the media to gain political mileage in the coming elections," Yeddyurappa said. "Above all issues raised by Congress leaders are irrelevant and false. The issue is a closed chapter," he told reporters, adding that "I'm consulting legal experts on this issue, I'm thinking about filing defamation case." Citing a media report, the Congress on Friday soughtan investigation by the Lokpal into allegation that bribes of Rs 1800 crore were paid by Yeddyurappa to the BJP's top brass. Congress chief spokesperson Randeep Singh Surjewala, addressing a press conference in New Delhi, said Prime Minister Narendra Modi should come forward and clarify. 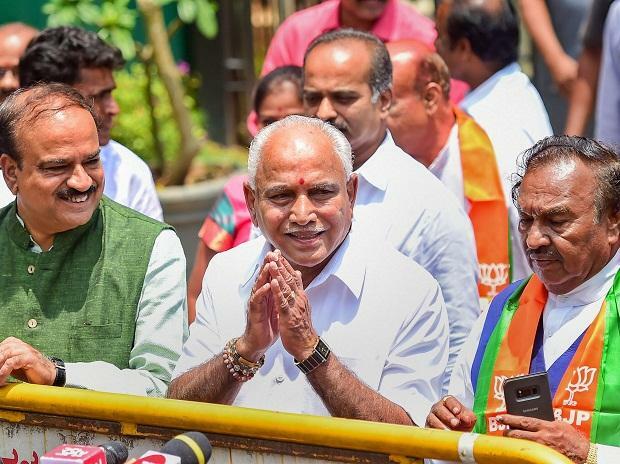 Accusing the Congress and its leaders of being bankrupt of issues and ideas, Yeddyurappa said, "They don't have any development issues to discuss in public. "Congress leaders are frustrated with the growing popularity of the Prime Minister Narendra Modiji and BJP. Theyhave realized that their defeat in the 2019 elections is imminent. They have lost the battle before it begun," he said. Surjewala said the report by Caravan magazine cited a diary containing details of the alleged pay-offs to senior BJPleaders and it was seized by theIncome Tax Department during raids. Meanwhile, Karnataka Chief Minister H D Kumaraswamy demanded a proper investigation into the issue. Speaking to reporters in Hassan, he said, "This is not surprising to me. The information about this earlier..when they were running the government I have seen theirbehaviour. A few people have misused Karnataka state as a green pasture. It should not happen, people also should understand this.. on one side they (BJP) speak about corruption and on the other side what they have done..reports have come in the media. I demand a proper investigation into it.